Whether semiconductor chip production grows or not in terms of sales revenue, but by volume the chip production is always rising. All the way from 65 nm to 20 nm, chip production was near full capacity in leading fabs in year 2014. The global semiconductor materials market increased 3 percent in 2014 compared to 2013 while worldwide semiconductor revenues increased 10 percent. Revenues of $44.3 billion mark the first increase in the semiconductor materials market since 2011, as per SEMI. Taiwan continues to be the hot place with nearly 1/5th of fab capacity, though China picks up hugely in chip manufacturing. TSMC is far bigger chip manufacturer compared to its nearest competitor. TSMC has all of its fabs in Taiwan. Chip fabs consume large amount of expensive and special material, in most cases whose manufacturing process is well-guarded intellectual property secret and patented by their suppliers. U.S.-based semiconductor equipment industry body SEMI has reported "The total wafer fabrication materials and packaging materials were $24.0 billion and $20.4 billion, respectively. Comparable revenues for these segments in 2013 were $22.7 billion for wafer fabrication materials and $20.4 billion for packaging materials. The wafer fabrication materials segment increased 6 percent year-over-year, while the packaging materials segment remained flat. However, if bonding wire were excluded from the packaging materials segment, the segment increased more than 4 percent last year. The continuing transition to copper-based bonding wire from gold is negatively impacting overall packaging materials revenues." Taiwan has consumed a semiconductor materials of worth $9.8 billion, and has grown faster than any other region. Japan claimed the second spot during the same time but not in growth. The second largest growth in 2014 is in North America with a growth rate of 5 percent, followed by China, South Korea and Europe. 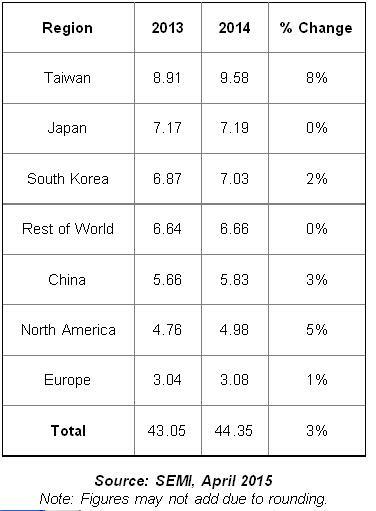 See the table below which provides sales revenue and also growth of semiconductor materials by region, as per SEMI. To share you another related comment Ng Kai Fai, President of SEMI Southeast Asia, commented “For 2015 and 2016, SEMI estimates spending of almost US$ 5 billion on front-end and back-end equipment in the Southeast Asia region, and another $14 billion in spending on materials including $11 billion on packaging-related materials. "